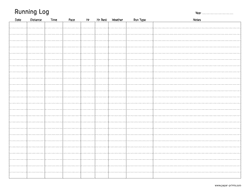 Print running log letter paper for free. Running log on a letter size paper in a horizontal, landscape orientation. A good way to keep track of your sports and health activities.